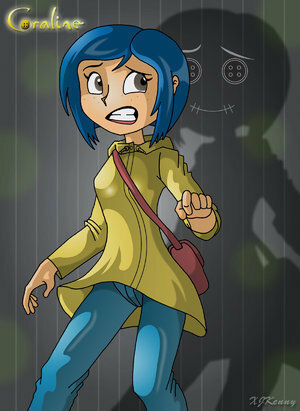 This Coraline fan art contains アニメ, 漫画, マンガ, and コミック. Whoa! Good drawing! OMG! CORALINE HAS BUTTON EYES IN THE BACKGROUND! this is soooooooooo coool! love it!!! LOOOOOOOOOOVE IIIIIIIIIIIT!!!!!!!!!!!!!!!!!!!!! I LOVE THAT MOVIE!!!!!!!!!!!! !